Koefaga Vanilla is a boutique producer of Vanilla Extract, Vanilla Paste and supplier of organic Vanilla Pods. Grown on Niue Island on small family organic gardens, the purity of the environment and simplicity of the lifestyle is reflected in the high quality of Niue vanilla. Just inside the Tropic of Capricorn, Niue is a small, geographically isolated, self-governing nation in the South Pacific Ocean. The Tahitian variety of vanilla is grown on Niue, See more about Var. 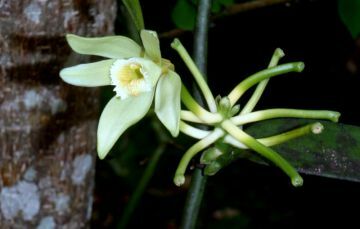 Tahitensis, internationally preferred as a culinary vanilla on our 'About Niue Vanilla' page. Vanilla is the only orchid that produces a fruit. Very hands on hands cultivation of the vines, hand pollinating of each flower, nine months for the pods to mature, a period of up to five months curing, followed by the art and science of extraction means it can be two years before the extraction process is completed. Koefaga is a small hands-on production house, with New Zealand based value added production and an island presence in Niue each year. If you are cooking for special dietary needs, are vegetarian, vegan, paleo, Vanilla is recognised as a natural flavouring. In Vagahau Niue, Koefaga, (said coy-fung-ha) " means 'deliciously delectable'. Say no more! Currently we ship throughout New Zealand, and worldwide to Australia, Japan, Canada, Singapore, United Kingdom, United States. Please ask us for a shipping quote for sending our vanilla to your country. All transactions in New Zealand dollars, as displayed.